It’s hard to know exactly how many waterfalls there are on the side of the mountain in a remote corner of southeast Haiti. From my vantage point on a nearby slope, I counted at least a dozen, and that was at the end of the dry season last year. The rainy season in the spring, I’d been told, puts the cascade in Cascade Pichon. From a distance, it looks impossible to get to the falls. During the ride there, in a four-wheel-drive Toyota Land Cruiser, it certainly felt impossible. We had traveled for seven hours from Port-au-Prince — and maybe two of those hours were on pavement. The rest of it was gravel, dry riverbed, flood plain and steep incline. One side of the alleged road was often a cliff. The last half-mile looked impassable because of the severity of the climb, the looseness of the ground, the sharpness of the switchbacks and the lack of guardrails to prevent one from pitching into thin air. I wasn’t convinced that a sure-footed mule could make this happen. But the driver didn’t hesitate as he revved the engine and threw the truck into low gear. We fishtailed and swerved and hopped our way to the top, blasting past a small church with hundreds of uniformed students in classes both inside and outside the building, past a flat spot big enough for a soccer game (which was perpetual), and finally to the peak, where during the 1970s Baby Doc Duvalier stood and gazed at the falls, declaring it one of Haiti’s greatest tourist destinations. Surely he got there by helicopter. I had to agree with the dictator on this one, though. The falls are spectacular. They are fed by an underground lake at the top of the mountain, and they burst out every few feet, like so many faucets stuck in the open position. We walked up into the falls, careful to make way for the occasional cow trotting downhill and a boy who appeared to be perhaps 10. At the bottom of the falls is a lush valley that becomes a lake when the spigots are fully loosed in late spring and fall. I discovered the falls while on a reporting trip to chronicle volunteer efforts among Haitians who are organizing their own community service groups. It brought me to this remote pocket of a country whose beauty has been devastated over the years by disasters — natural, economic and political. The earthquake that struck four years ago was a combination of the three, causing billions in damage and thousands of deaths, swiftly followed by a cholera outbreak that has killed thousands more, and a presidential election that led to violent protests. The idea that nature could be used to Haiti’s advantage for once has taken root again among nonprofits and officials who are seeking to position it as an ecotourism destination. An astute local businessman, hoping to realize Mr. Duvalier’s dream a few years ago, built the one-story Hotel Deruisseau on a mesa directly across from the falls. I stayed there, though I would describe it as more of a “sleeping space” than a hotel: The room had a bed, a night stand and an overhead bulb, all behind a door that didn’t quite clear the bed. There was a shower in the communal bathroom, but no shower head — just a pipe that poured cold water, like one of the tiny cascades. (Hot water was a luxury that you have to do without.) Electricity from the generator was shut off at 10 p.m. But as I lay in bed, all I could hear was the falls — the greatest white noise ever. I woke up to a breakfast of plain noodles, lettuce and Doritos (extra cheesy), prepared by locals who served us in a community gathering area (concrete slab, metal roof) about 50 feet from the hotel. Just down from there is a community that lost five people to cholera a few days before I got there. A couple of newly plucked chickens lay in a bucket in the corner of the room. Dinner. My fellow guests there were not tourists. They were Haitian doctors and nurses who built a nearby clinic (just across the valley from the falls) with the help of some American volunteers after a census revealed that the communities surrounding the cascade lacked adequate health care. That this stunning attraction remains a well-kept secret was stunning in and of itself. We couldn’t stay for the chicken dinner, because there was another hard-to-reach area we wanted to visit. We descended the mountain and headed in another direction; we joined National Route 4, a “road” that begins at Haiti’s border with the Dominican Republic. After two more hours of tire-shredding, neck-snapping terrain, we suddenly hit pavement, or at least graded dirt and gravel, and arrived at the coastal city of Belle Anse, population 51,000. The town square is rustic, with touches that felt modern after the cascades: paved streets, electricity, stores, restaurants, office buildings with working toilets and running water, a radio station and a medical clinic with an adjacent cholera-treatment facility. The men and women I met there were young, educated, business-minded and energetic. Within a few hundred feet, though, the road disappears and travelers step back in time. Housing then becomes a combination of wood, cinder block, concrete and tin. All of it is vulnerable during the rainy season as water sweeps from the surrounding mountains to the shore. But it is also reminiscent of the Hawaii of the 1930s. There were cliffs, fishing boats, a beach, a lagoon, even a cliché scene of fishermen weaving nets under a cluster of palm trees. 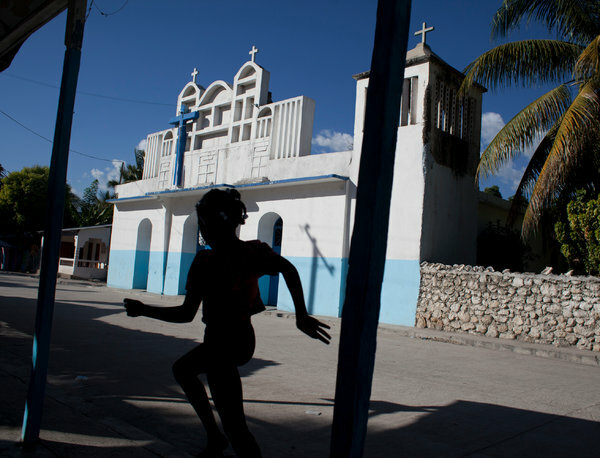 Belle Anse embodies the contradictions you find in Haiti. The natural beauty of the beaches stops you dead in your tracks. So does the poverty. So does the potential. Most of the tourists who visit are from the nearby island of Guadeloupe, said the town’s mayor, Pierre Mercidieu. His community is less touristy and less developed than much of that island, so people come for the simplicity, he said. I’m no dictator, but even I saw potential for more tourism. So I had to ask Mr. Mercidieu the obvious question about the only obstacle to attracting visitors: that road. The only other way to get there is by small fishing boat, a 48-mile journey from the closest city, Jacmel. Had the mayor considered making it easier for travelers to get there, and for developers to want to build hotels or resorts?